After drawing out 4 frames on top of each other in full size, I realized that seat angle is not quantified when fitting riders to a frame. In other words, we quantify reach, but going from the BB back to the saddle we do not have a measurement for it, and the seat angle does seem to affect the overall fit of the bike. Yes, the saddle can be adjusted fore aft, however when comparing frames, there should be a number for this measurement. Tell me where I have gone wrong here. Measuring from the BB back to the saddle itself is an impossible number to give in this case, because it is not a frame measurement. 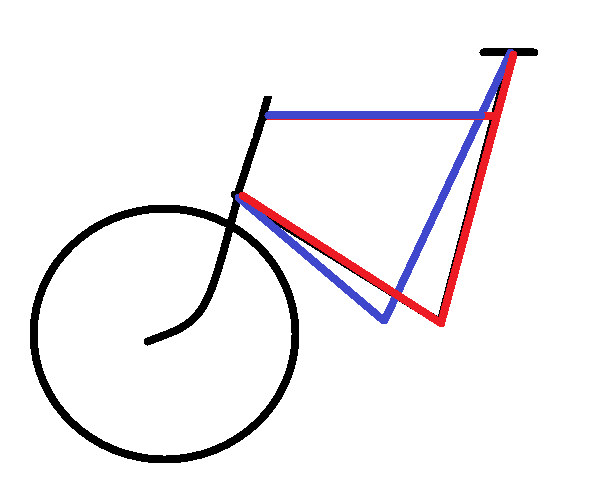 It going to vary with the saddle used, and where it is set fore/aft (based on seatpost setback and adjustment on the seat rails). What you CAN quantify is the horizontal measurement from the BB to a line drawn along the seat tube. And you can get that distance by subtracting the "reach" from the "effective top tube length". This will give you the horizontal distance from the bb to the seat tube at a height that is level with the top of the head tube. However, this really does not tell you much. Because what matters with fit is not where the seat tube is in relation to the bb, its where the saddle is in relation to the BB. And between the saddle rails and various setback seatposts, there is a massive amount of fore/aft adjustment available in that regard. From a fit (or handling) perspective, as long as the saddle in in the correct position relative to the BB, it does not matter whether you get there with a steep STA with a setback post and the saddle slid back on the rails, or a slack STA with a straight post and the saddle slid forward on the rails. I guess it is possible that the STA could be so far off that you simply can't get the fore/aft position you need, but that would be rare. In any event, simply knowing the STA would let you know if this was the case. CADding it out, on a 53cm frame, changes in seat tube angle will change saddle position about 10mm for every degree of seat tube angle change, at least in the 71°-75° range. Depending on what one needs in saddle position to achieve good balance, this may or may not be an issue. I'm a long torso guy who needs the saddle all the way back on a setback post. Some bike and saddle combos don't have quite enough adjustment to suit me, but I get by. YMMV. So in your case, I guess you need a slacker seat tube angle than most. Do you know around what seat tube angle becomes too steep for you? Relating this back to the OP’s point, you don’t really need the measurement he is describing, you just need to know the STA is not to steep. Do I have that correct? Doesn't matter for this discussion. We have no idea of the OP's requirements. When buying a bike, the thing to do is to sit on it on a trainer in the shop and have them adjust it and swap components to suit your preferences. If they can't, probably wrong size or sub-optimal frame angles for you. I've found that there is a tendency of some manufacturers to use steeper STAs in smaller sizes to reduce toe overlap - at the expense of fit of course. STA has no effect on toe overlap. The HTA is often more slack on small frames, usually creating more toe room, along with more trail. Huh. That's a pretty solid statement, isn't it? No effect, eh? So have a look at these geometry charts, and tell us why manufacturers changed the STA unless it was for toe overlap. We notice that both STA and HTA change with frame size. Some manufacturers hold STA steady with frame size change, but by no means all. Please explain how seat angle could influence or mitigate toe overlap. Toe overlap is a function of the distance from the bb to the front axle. This is mainly determined by reach, head angle, and fork offset, wheel/tire diameter, and to a lesser extent by stack and fork length. I can't see how STA would have any effect on this distance. You do often see differences in head angle and fork offset on smaller frames, and I always assumed that was to help address issues of toe overlap. I don't really know why they change the STA, but my best guess would be because they anticipate a difference in the bb to saddle fit needs for shorter legged riders. Please explain how seat angle could influence or mitigate toe overlap. Steepen the seat angle, set the rider up in a more forward position so that they're able to use a handlebar that's farther forward, and push the whole front end forward accordingly. There are probably some *actual* reasons to steepen the seattube for shorter riders; similarly, large frame sizes sometimes use slightly slacker seat tube angles than the middle sizes. Femur length relative to leg length, and flexibility between thigh and torso, could both impact what's optimal. It's nice when they change the fork offset when they change the head angle, but they don't always do this. A lot of small bikes have silly high trail figures resulting from taking the same forks used on larger sizes and slackening the head angle to reduce toe overlap. Because, if the saddle is in the same place, steeping STA moves the BB back. It's not a huge difference, maybe 1 cm/degree, but if they also change the HTA, enough to make a difference.. Seems simple to me. In that case it is not the STA that reduced the toe overlap, it was the change in the HTA. You don't seem to get ti. If one moves the BB further from the wheel, that reduces toe overlap. I don't see why that's not obvious. The diagram above shows how increasing the reach of the frame helps toe overlap. The STA had nothing to do with it. Making the STA steeper itself does NOT move the bb farther from the front wheel. Yes, it moves the bb farther back relative to the saddle (as you mention above). Hovever, it also moves the entire rest of the frame further back (relative to the saddle, if it is not slid fore/aft) including the front wheel. The bb to front wheel distance is unchanged, UNLESS you also increase the fame reach, increase the fork offset, or slacken the HTA. In the diagram above (with the red and blue frames), The STA and the reach are both changed. But it is the frame REACH that changed the bb to front wheel distance, not the STA. Also, the frame with the steeper STA in that diagram would actually fit a larger rider, not a smaller one, because you fit bikes by reach (and stack) not STA. A taller rider would more likely ride the frame in that diagram with the steeper STA becuase it also happens to have a longer reach. They would just be more likely to need to slide the saddle farther back on the rails. Last edited by Kapusta; 12-08-18 at 09:21 AM. The argument I am seeing here seems to come down to stating that a steeper STA increases the bb to front wheel distance becuase when you combine it with longer frame reach or slacker HTA that it in fact does increase bb to front wheel distance. That is sort of like saying that toast is high in fat because when you combine it in a sandwich with eggs and bacon, you have something high in fat. Has anyone other than you ever mentioned keeping frame reach the same? There are two kinds of reach, "rider reach" and "frame reach." Rider reach refers to the distance from saddle to bar and is one of the two main elements of bike fit, the other being saddle to pedal axle distance. Riders buy and set their bikes for the reach they prefer. Using frame reach and stack as a fit definition does, as you point out, regard STA as a fixed quantity. Under that theory with unvarying STAs, buying a bike by frame reach will translate into expected rider reach. Except as we see by the frame geometry charts I posted, STA frequently changes with frame size. IOW, buying a bike by frame reach only works if you are replacing a bike with an identical STA. Otherwise people by bikes by rider reach and let the manufacturer take care of toe overlap by means of STA and HTA. Arguing that it works the reverse way, that riders must accept a fixed BB position and the toe overlap which goes with it doesn't make any sense and is not, obviously, industry practice. @HTupolev's posted diagram makes that very clear. If rider reach is maintained, and STA is increased, the BB moves aft, along with the rear wheel, and of course frame reach increases because STA is increased. I just built a frame with a longer top tube to have no TCO, ... with mudguards..
so the wheel out from under the C of Mass, a bit, was OK.
going fast you don't turn the wheel much, in cornering..
Last edited by fietsbob; 12-09-18 at 02:42 PM. That seems like a horrible way to fit a bike throwing off the balance to deal with a non issue like toe overlap. Oh, I'd say that depends. If you would have 1-2 cm overlap, I think that can be fixed with frame angles at no noticeable detriment. Over that yes, just accept it. I have toe overlap on our tandem with my winter boots and fenders. It's OK. There's one 180° uphill turn on a narrow bike trail that can be an issue, but we get around OK as long as there's no traffic. I ride an old 52 cm carbon Trek with what looks like a normal STA, except that it lands on the DT well forward of the BB. Probably helps frame damping. I have a long torso for my height, so my saddle is all the way back on a setback post, long stem, and I still have more weight on my hands than I'd like, but it works well anyway. I use clip-ons for big endurance rides. The bike's actually a great fit for me. Last edited by Carbonfiberboy; 12-10-18 at 04:52 PM.